The project I’m reviewing today is called 9Returns. First association that comes to my mind is the myth of cat’s nine lives. I’m not sure if 9Returns have them and if the administrator wanted to make such association. In short, 9Returns joined DavidNews.com Golden Stage listing on the 29th of March, and it has been online for three days already and is a newbie. Currently, I’m keeping in the program my $400 investment, and I would like to understand when it’s the right time to withdrawal it and if I can make some profit here. Shall we start? Right from the beginning, the administrator wants to give you an impression of a legit business because the company registration number which is displayed on the first page of the website is real. I did search for it in CompaniesHouse service and found the entry containing company name 9 Returns Limited registered at the same address as written on the website. The company has been registered on 1st of February 2017 and is already two months old. As I wrote in the opening paragraph, it is a total newbie, which in many cases doesn’t make any difference in terms of safe investing. Every website owner must think of user experience, to keep a reader, shopper, or an investor on the site. 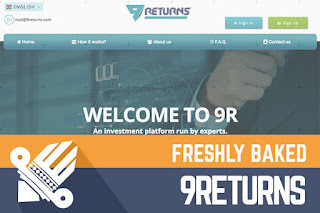 9Returns admin has put extra effort and created a unique design, which is mobile friendly. Why am I saying it? There are so many programs, which don’t think of mobile users. However, I don’t see any references on the website script to HYIP templates, and most likely the admin has made it from a scratch or customized any existing website. In general, it looks fine to my eye, and it’s easy to navigate. And now, last but not least, an aspect which I want to mention before I get to 9Returns investment plans are communication. You can get in touch with the admins through several channels – e-mail and phone. In addition, they have profiles on social media. Of course, here we can see another unrealistic social media strategy, which has gained more than 550 likes on Facebook with only two posts. That’s a pretty impressive reach and engagement rate! At least, Twitter and Instagram accounts look more realistic for two days old program. Twitter – 4 followers, Instagram – none. I must admit this is not the highest number of likes I have seen for such new program, but I believe you understand where I’m heading with it – most likely it’s a result of purchased likes or profile. Finally, how much money can I make if the program will not end somewhere in the middle of my investment period? 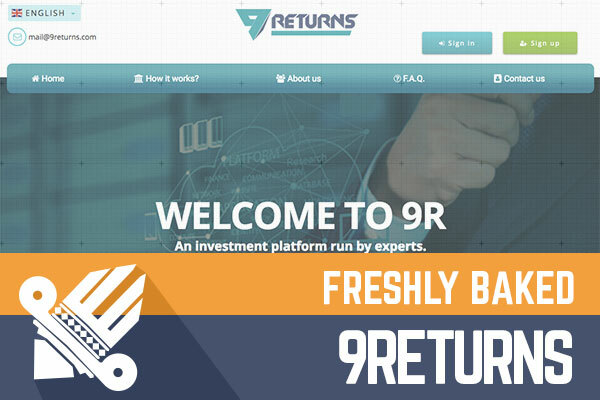 9Returns is offering three investment plans with different investment time, maximum investment and interest rates. First, ALL TECH – 2.5% a day for an unlimited time. However, please pay attention to the fact that your deposit will be locked in and will not be returned. Second, The Vitals – 6% daily for 25 business days. Third, Big Wheels – 8% daily for 20 business days. In these two plans initial deposit will be included in the payments, so generally speaking these two plans are safer for investment because you can earn initial deposit and reach profit zone way faster. Here we can see the impressive differences between the interest rates. Well, you can earn it back if you stay in the program long enough. Just to give you an impression, a $400 investment in the first investment plan will start generating profit only after 40 days. After another 40 days, it will make another $400, but I must admit 80 days is a very long time, so maybe if you choose investment plan than another two are a way to go. Another important thing to keep in mind is that second and third plan will gain profit only during business days. In the meanwhile, you can use the investment calculator on the website to see the differences between plans and potential profit, which is the easiest way. The program itself looks average to me without any unique or unusual features. Though it seemed well structured and neat, which most likely required some effort to the administrator. The program allows making investments starting as low as $10 and up to $100000. As I already wrote, earlier I’m a big fan of investment plans where the initial deposit is included in the payment. Therefore, I see 9Returns plans safer comparing to programs promising to return the investment. But it’s just my honorable opinion about such plans in general. In the meanwhile, it’s hard to predict what’s going to happen with this program on the following days or weeks. Therefore always evaluate investment risk and invest money that you can afford to lose! Investment plans: 2.5% daily forever every calendar day, deposit locked in. 6% up to 8% daily for 20 up to 25 business days, initial deposit included in the payments. On Bonus Bitcoin you can get free satoshis. Up to 5,000 satoshis every 15 minutes. Ever tried maximizing your free BTC collections with a BTC FAUCET ROTATOR?